Bayern Munich crushed Bayer Leverkusen three times last season and should have no problems in Munich (AFP/Getty Images). Bundesliga leaders Bayern Munich host struggling Bayer Leverkusen at the Allianz Arena with one way traffic expected. The Bavarians have trampled over Leverkusen in recent games and the trend is set to continue here. The German Champions started their Bundesliga season with two wins and already sit top of the table. A 3-1 home win against Hoffenheim was followed by a dominant 3-0 win at Stuttgart before the international break. New signing Leon Goretzka started the match and opened the scoring before assisting Robert Lewandowski who made it 2-0. Lewandowski then turned provider for Thomas Müller as FC Bayern held the hosts at bay, Stuttgart failing to register a single shot on target. Manager Niko Kovac is missing Kingsley Coman with Serge Gnabry challenging Arjen Robben and Franck Ribéry for a spot on the wing. Thomas Müller celebrated his 29th birthday on Thursday. He has started the Bundesliga season with a goal and an assist in each match and scored a hat-trick in his last game against Bayer Leverkusen. 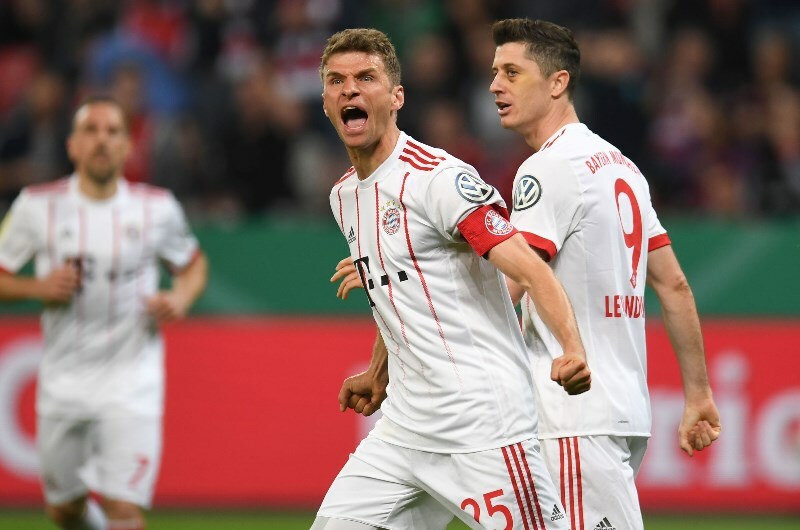 Bayern Munich's Thomas Muller scored a hat-trick against Bayer Leverkusen in the DFB Pokal semi-final in April (AFP/Getty Images). Leverkusen have had a terrible start to the season, edging past lowly Pforzheim 1-0 in the German Cup before losing their first two Bundesliga matches. Manager Heiko Herrlich is under pressure with his side looking far too open and lost in transition. Their last match was a 3-1 home defeat against Wolfsburg which came after Leon Bailey gave Leverkusen a 1-0 lead. Injuries in defence and defensive midfield haven’t helped but goalkeeper Lukas Hradecky should return here alongside Charles Aránguiz and Sven Bender. 19-year-old Kai Havertz recently earned his first call up to the German national team and will likely revert to his preferred attacking role. Panagiotis Retsos and Julian Baumgartlinger are still injured which limits Herrlich’s options in defensive positions. Bayern Munich have traditionally dominated Bayer Leverkusen, winning 49 of the 82 encounters and almost unbeatable at home. In Munich there have been 31 wins for FC Bayern and just three defeats. Bayern Munich won both Bundesliga matches 3-1 last season and won the DFB-Pokal semi-final 6-2 in Leverkusen with Thomas Müller hitting a hat-trick. Bayern Munich are missing just one player and have too much quality in every department. They crushed Leverkusen last time out and it’s difficult to see any other result here. Bayer Leverkusen have conceded five goals in their opening two matches and are still finding their feet. This match could get ugly. Bayern Munich have won 24 of their last 29 home matches (Bundesliga). Bayern Munich have won their last 3 matches against Bayer Leverkusen, scoring 12 goals (All competitions). Bayern Munich’s Thomas Müller scored a hat-trick in his last match against Bayer Leverkusen (DFB-Pokal). Bayer Leverkusen have lost 3 of their last 5 away matches (Bundesliga). Bayer Leverkusen have failed to score a goal in 4 of their last 5 away matches (Bundesliga). Bayern Munich have smashed Bayer Leverkusen in their last three encounters including a 6-2 mauling in Leverkusen last time out. This should be another comfortable win for the Bavarian juggernaut and Thomas Müller is in a good position to score again.